Mayor John Tory's Diwali Celebrations at City Hall! ~ The Toronto Hare Krishna Temple! 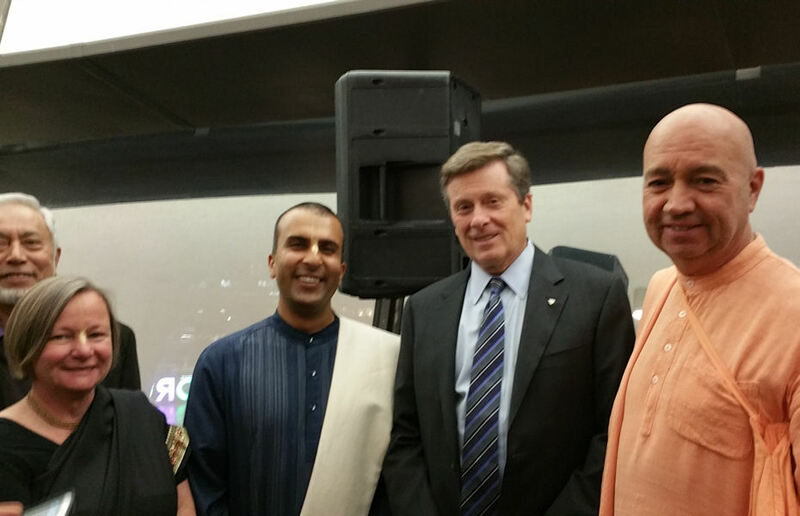 Mayor John Tory's Diwali Celebrations at City Hall! On the evening of Wednesday, November 18, 2015, a special event took place at City Hall in the heart of downtown Toronto. 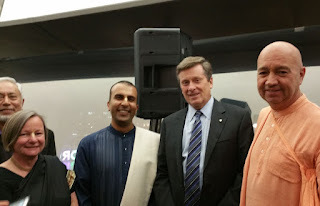 Mayor John Tory, the political head of our vibrant City of Toronto, hosted his first ever Diwali celebrations at City Hall and representatives from the Hare Krishna Temple were invited to this special evening. As many of our devotees may recall, Mayor Tory took part in our Ratha-Yatra (Festival of India) celebrations this past July and he spent several hours at our festival, visiting the booths, taking darshan (audience) of the Deities and addressing the crowd at the main stage! A nice connection was made and so we got a personal invitation to attend his Diwali celebrations. Bhaktimarga Swami and members of the ISKCON Toronto Temple Council attended the event and they absolutely enjoyed meeting many esteemed members of the South Asian community. The evening began with mingling and refreshments, continued with musical performances and then concluded with a very inspiring speech by the Mayor himself. Upon meeting the Mayor during the post-event mingling session, he immediately said, "What an amazing time we had on the Toronto Islands! Thank you for inviting me to that special festival!" It was nice to see that the Ratha-Yatra (Festival of India), our biggest festival of the year, made such a positive impression on the Mayor and that it was so memorable for him. Check out the pictures of the event below! Also, we've captured a "screenshot" of Mayor Tory's Twitter account as he "retweeted" the Temple Council's tweet about the event to his 82,000 Twitter followers! Hare Krsna!